I have really been having fun making these things! Aren’t they cute? 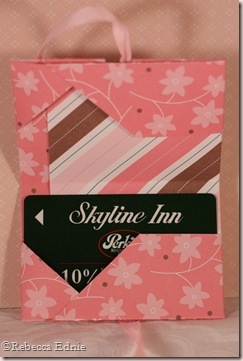 This one is made using the directions at Cami’s blog 8×8 origami gift card holder. 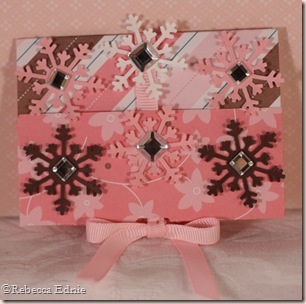 Quite easy to make but be sure to use lightweight paper! 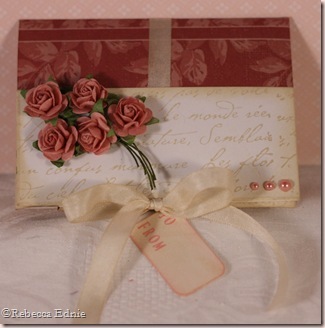 Heavy DP or even medium weight will be hard to fold and buckle somewhat when folded. Here’s what it looks like inside. Another using the same template. This is my favourite so far. This paper wasn’t double sided so I decorated the exposed parts with a background stamp and sponging. I know it isn’t winter themed but I’d love to get this so I hope someone else loves it too. Hi, I appreciate the skills of your blog writing and the time sharing with us.I recently came across your blog and have been reading along. I thought I would leave my first comment. I don't know what to say except that I have enjoyed reading. Nice blog. I will keep visiting this blog very often.